GTD externalizes everything from our head but the actual thinking and execution. This external system – electronic or paper based or combination of both – guides us what and when to do something. Just like we put a meeting on our calendar or set the alarm clock, we need to delegate the management of work to an external system. Collect is promptly capturing all stuff that is entering our lives – emails, queries, letters, ideas – in an external medium (a paper, in-basket or an electronic list). Key is to simply collect stuff – not evaluate what to do about it. Organize is where you organize the processed stuff . You can store it for future reference or mark it as “Someday” or “Waiting For”. Someday means you may want to get to it sometime later. Waiting for indicates you are awaiting input from others. Key is for the organization system – your cabinet or electronic structure – to be efficiently accessible. Review is weekly reviewing stuff you have in your system, ensuring that you are on track and adjust if required. For example, you go through the “Someday” and “Waiting for” list to see if you need to take some action on them now (e.g. schedule the item or send a reminder). The Review is essentially an “inspect, evaluate and adapt” process. Do is the actual execution of next actions. It does not always have to be the highest priority item but is driven by our situation. For example, if we are outdoors with no internet, we can do the outdoor errands. If we are online, we can attend to our reading list on web. If we are in office, we can talk to our manager directly. Any stuff entering our lives – from the smallest task to the biggest project – should go through these stages. For example, an email we receive goes into our inbox (captured). We read it to decide what to do about it (process) e.g. reply it right away. We can archive or tag it for future (organize). A later look (review) may result in possible sending of a reminder (do). GTD can manage the complex world of a knowledge worker, with multiple and frequent inputs, most of them needing further analysis. It lets the knowledge worker do what he does best – use his brain – and let the system take care of the workflow. It creates an efficient external system to make the knowledge worker effective. I am sure Drucker would have liked it. GTD is tool agnostic – it lets its followers work out their own ways to execute it. In the next couple of posts, I will talk about how I personally manage my GTD workflow. Stay tuned. Meanwhile you can find more about it here. 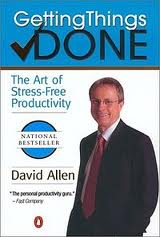 The GTD book is worth the money too.